Fall is the perfect season for outdoor entertaining. After the hot summer months, but before the chill of winter, fall greets us with colorful landscapes, Halloween celebrations, and the start of family gatherings. Outdoor parties are easier to plan because you don’t need to do much cleaning before or after the event. You have more open space outdoors as well. 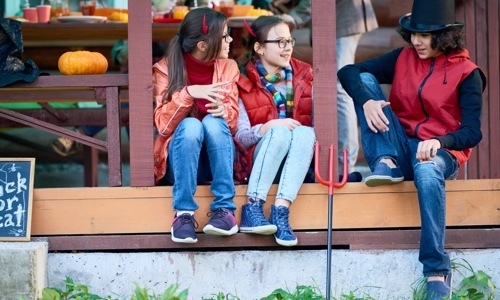 Autumn is a great month for hosting outdoor events for a variety of reasons. For one, the heat has finally subsided. Another benefit of fall is fewer bugs. With the onset of Autumn’s cooler evenings, we see less and less insect activity. Once more, Football and soccer season has just started. Halloween is around the corner and Oktoberfest lasts the entire month of October! Because of this, we believe fall is the perfect season for outdoor dinner parties, fires, and family gatherings. If you have decided to host a fall party we have some great party ideas to make your event a smashing success. Seasonal tastes and decorations combine to set the mood. Lighting is key for any fall gathering. Since it turns darker earlier, deciding on a lighting solution BEFORE the event is a necessity, especially if it may run into the evening. String lights, mason jars, and paper lanterns are all great options for providing light and an appropriate fall aesthetic. A little ambient lighting goes a long way while it’s getting dark. The goal is to invest in lighting that produces a warm glow. Your eyes will adjust to the darker setting, so placing lights along the side of the deck, the fence, or even hanging them from tree branches are all equally great options. Fire pits are a classic go-to for lighting and heating during the autumn season. A fire pit also has a variety of uses such as providing warmth, light, and atmosphere. When hosting an outdoor event in the fall your guests’ comfort levels should be a top priority. Luckily, there are many outdoor heating options to choose from. If you have a smaller yard and are hoping to avoid large heat lamps taking up valuable floor space, you may choose to invest in infrared heaters which can be mounted on the wall or ceiling of your event space. Infrared heaters produce radiant heat that heats objects and people, not just the surrounding air. When planning a special holiday event your first step should be to gather the guest list. This will help decide how much room you will need. It is good practice to get a count of children vs. adults as well as any special diets you will have to account for. This will help with the later planning steps. Decorating and creating social zones. It is important that you control the flow of traffic by providing designated spots for play and conversation. No matter how big your party is, you do not want everyone clustered in one place. This can be fixed by setting up seating, and food/drink areas that guests will naturally move to. You may choose to set up a centralized self-serve drink station while having food in a separate but close location. For events with children a table with activities may be placed out of the flow of traffic. If using a fire pit we recommend you do the same for this area. This is another important part for the event. You must decide how you are going to provide food for your guests. Will you order food from a third party, cook it yourself the night of, or prepare it several days before the event? If you are preparing the meal yourself you may want to take inventory of how much help you will have in the kitchen. This will no doubt have an effect on the food you prepare. If you are hosting a larger party (20+ people) focusing on foods you can prepare ahead then just heat and serve may be a smart route to take. This allows for more culinary freedom. You prepare basically any food days before the event, freeze, or refrigerate, and then heat and serve come party time! For those events of over 100 people, hiring local chefs to help out may be the easiest choice. When you hire independent chefs you are freeing yourself up to enjoy your party and allowing for your guests to enjoy food that must be prepared on the spot! If you want your guests to be a part of the event, you can request they bring their favorite fall side dish. Oddly enough, everyone seems to have one. This allows for everyone to participate in the celebration and helps you avoid a lot of additional labor in the kitchen. This works especially well if you have friends who are more culinary inclined than yourself. NOTE: Don’t forget dessert! For dessert, classic dishes like pumpkin pie, apple pie and ice cream are always appreciated. Don’t forget about your adult guests! As far as alcoholic beverages go red wine is always a safe choice. Also, around this time of year, many brewers release their seasonal craft beers in flavors like pumpkin and apple cider. These seasonal beers go great with a lot of holiday flavors and meals. Games don’t have to be complicated. Kids can make anything fun. If children will be attending your party, you are going to need activities to keep them entertained! Set up a table(s) with festive decorations and craft supplies. The children will spend hours decorating pumpkins, coloring, and will even have something to take home. The goal of a kid’s table is to be fun and easy, with projects that can be completed without much adult intervention. The crafts can be anything. Most children love crayons, construction paper, and glitter! The point of the crafts and activities isn’t to keep the children entertained for the entire event. The arts and crafts are a great way to settle in the children when they first arrive. Eventually, they’ll all begin exploring and playing together. If you don’t have the space for arts and crafts, or simply think it requires too much effort, you can provide the children with fun toys like light sticks, inflatable balls, and large empty sacks for races! Depending on the child, you may encounter some with picky appetites. This is when goody bags filled with light snacks may be appropriate. Apple picking is a great fall activity. Live music is also fun for your guests. A band will bring energy to the party and children love sitting in the grass listening to the music and watching the musicians. Adequate parking is a must. Nothing ruins the mood quicker like walking out to your car and seeing a ticket for a parking violation. You can request permission to use a local school’s parking lot or ask neighbors if guests can use their driveways. Make sure to let your guests know the parking arrangements before the event!